The Fundamental Constitutions of Carolina, called the "Grand Model," provided the form of government and society for the Carolina colony from 1669 to 1698. The Lords Proprietors of Carolina first issued the constitutions in 1669, then disseminated revisions in 1670, January 1682, August 1682, and 1698. The constitutions were suspended from 1693 to 1698. The main purposes of the Fundamental Constitutions were to protect Proprietary interests and to avoid the creation of a democracy. The Proprietors used the constitutions to try to establish a feudal government and society, so far as permitted by the Carolina charter of 1663. The feudal government was to be headed by nobles with the titles of palatine, landgrave, and cacique. They were to rule through their own courts, a grand council, and a Parliament. Freemen were to have a voice in government, but slaves and others who were bound were to have none. This government and feudal society were never fully implemented. Only the palatine's (Proprietor's) court operated for a time. Herbert R. Paschal Jr., "Proprietary North Carolina: A Study in English Colonial Government" (Ph.D. diss., UNC-Chapel Hill, 1961). "The Fundamental Constitutions of Carolina : March 1, 1669" The Avalon Project. Yale Law School. http://avalon.law.yale.edu/17th_century/nc05.asp (accessed October 30, 2012). Parker, Mattie Erma E. "The First Fundamental Constitutions of Carolina." The South Carolina Historical Magazine 71. No. 2. Apr., 1970. pp. 78-85. http://www.jstor.org/stable/27566981 (accessed October 30, 2012). Attig, John C. "Part One: Works by Locke." John Locke Bibliography, Pennsylvania State University. http://www.libraries.psu.edu/tas/locke/bib/ch0a.html (accessed October 30, 2012). Locke, John. The Fundamental Constitutions of Carolina, London. 1669. Image from Wikimedia Commons. 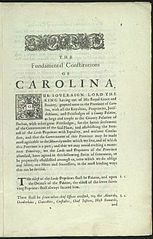 http://commons.wikimedia.org/wiki/File:Fundamental_Constitutions_of_Carolina.jpg (accessed October 30, 2012).